Team up with ePromos to make the most wonderful time of the year even more magical! We can help you do anything from designing a special box for corporate gifts to producing business Christmas cards and presents for your clients. The holidays are the perfect time to thank staff, customers, and business partners at the end of the year while simultaneously raising awareness of your brand and messaging. Dream up ways to spread a little seasonal cheer with our vast selection of custom cards, promotional ornaments, and gift options. Promotional snowflake ornament with a 3" photo insert is a great way to bring winter memories and your logo for the holiday season. You'll never get a piece of coal with your logo on this Custom Christmas Stocking. Vivid Holiday Custom Ornament - 3.25"
Make a big statement this holiday season with this imprintable holiday custom ornament. Add a wow factor to your custom pens and have it inserted in this vibrant full color pen box custom packaging. These dazzling Hammered Glass Custom Ornaments - Star have a unique look unlike traditional glass ornaments. Featuring a unique hammered texture, this eye catching ornament makes a great holiday gift. Add vibrant full color custom packaging to your hand sanitizer giveaway to give your brand unbeatable recognition setting you apart for the competition. Your customized golf ball giveaways will be par for the course when you present them in this full color golf ball box custom packaging. Silver Snowflake Promotional Ornament - 3.3"
This elegant and contemporary promotional ornament will hang beautifully from any tree. Your customers will remember you year after year! Think outside the box and present your small promotional gifts in this full color pyramid shaped custom packaing. These Round Hammered Glass Custom Ornaments have a unique look unlike traditional glass ornaments. Featuring a unique hammered texture this eye catching ornament makes a great holiday gift. Add value and brand recognition to your promotional t-shirt gifts and present them in this vibrant full color custom packaging and set yourself apart for the competition. Add brand recognition to all your promotional gifts and present them in this vibrant full color custom packaging that your recipients will remember. Turn your promotional golf ball giveaways in to something spectacular when you pair them with this full color golf ball sleeve custom packaging. Add a fun twist to your promotional gifts with this full color purse style custom packaging that is ideal for any women's event. This full color custom packaging is an out of the box idea to give out your favorite mug stuffer candy in that your recipients will remember. This full color popcorn box custom packaging is a fun way to promote your brand while providing a yummy popcorn treat that everyone loves! Make your small promotional gifts really stand out and present them in this full color small cube box custom packaing. Add a little more flavor to your delicious cupcake treats and present them in full color custom packaging your recipients will remember. Add a wow factor to your promotional coffee mug gift and present them in this full color custom packaging that will get your clients attention. Add some flare to your favorite cookie gifts and deliver them in full color custom packaging your recipients will remember. Natural Kraft Custom Gable Boxes are great for office luncheons, gifts, and tradeshow kits. 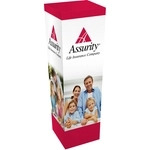 White Gloss Custom Gable Boxes are great for office luncheons, gifts, and tradeshow kits. Spread joy and cheer this season by sending out this Gold Bow Imprinted Holiday Greeting Card! This premium holiday card is perfect for thanking you loyal clients and employees. Celebrate Christmas this year with the gift of music together. Comes with a promotional greeting card and CD with religious music tracks. These festive Gift Tag Shaped Hammered Glass Custom Ornaments are uniquely shaped and are perfect for topping off you holiday gifts. Unique hammered texture, this eye catching ornament makes a great holiday gift. Personalize this Plush Star Custom Ornament w/ Gift Card Pocket for your next holiday party! Choose from three cute designs. Send a little joy and happiness this season by sending this Joy Wreath Imprinted Holiday Greeting Card! This premium holiday card is perfect for thanking you loyal clients and employees. These festive Oval Shaped Hammered Glass Custom Ornaments have an eye catching look unlike traditional glass ornaments. This unique ornament makes a great holiday gift. Each Wood Custom Ornament arrives in a natural kraft envelope along with a twine cord for hanging. Choose from four festive shapes! Tis' the season to spread joy and send out this Filigree Snowflake Imprinted Holiday Greeting Card! This premium holiday card is perfect for thanking you loyal customers and employees. Put the finishing touch on your holiday packages with our custom imprinted ribbon. Your logo or message can be imprinted in full color with this promotional ribbon. It's the season to be joyous and sending out your imprinted holiday greeting cards. It's the season to be joyous and sending out your promotional holiday greeting cards. It's the season to be joyous and sending out your imprinted holidayl greeting cards. Are you looking for a way to wrap your corporate gifts for customers, clients, partners, and employees? Wow your audiences by turning bags and bows and boxes into hard working marketing tools by adding your logo, message, and brand colors to packaging. When your business is presenting another business with a gift, look to ePromos to offer high-quality custom gift packaging and personalized product packaging supplies. These supplies include decorative bags that highlight your brand, gift boxes with your logo, ribbons repeating your company’s slogan, or bows to top off every package, giving a promotional spin to each giveaway. Here is a quick read to let you know about almost everything we have to offer on these gift packaging pages. Our selection also includes boxes that are specifically designed to fit certain products such as pens, hand sanitizers, t-shirts, coffee mugs, golf balls, bottles, food boxes and more. So, if you need cupcake boxes, donut boxes, to-go boxes or gabled entree boxes, ePromos has them. This collection also includes promotional products specific to the holidays. Our seasonal greetings include, business holiday cards, Christmas cards, photo frame cards, cards with personal greetings on a CD, and musical cards. For easy-to-send appreciation gifts, ePromos will also customize gift cards for dining, music, movies, data, membership and more! And if you’re looking for a unique idea that reflects your company’s eco-friendly attitude, send our seeded paper holiday greeting cards. We also carry ornaments, Christmas stockings, sheer organza gift pouches and many other choices. Let’s talk about the CDs we offer. Your CD can be a personalized message, an audio “Thank You” inside a greeting card, a gift of Christmas classics, rock & roll party CDs and a holiday party CD with music from all the greats. Stylish options include different sizes, shapes, and price and depending on the product you choose, we offer a variety of options to bring your logo to life: embossing, elegant foiling, four-color printing, hot stamping and debossing. Don’t be shy! If you need help getting your brand noticed or if you need help choosing your promotional product or design, contact us. Our team of Brand Consultants will help you bring your brand to the center of attention by adding a personalized touch to any gift – big or small.